Dolly Parton’s Homecomin’ 2009 train rolls in! 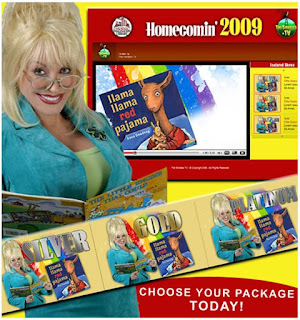 Dolly Parton’s Homecomin’ 2009 event, which is linked with the hugely successful Imagination Library kicked off on July 8th when filming took place at the Music Road Convention Center and the Dollywood Adventure Park both located in Pigeon Forge, Tennessee. Dolly's Imagination Library donates over half a million books monthly to children from birth to age five across three countries each and every month! The film, produced by S.D. Professionals, LLC in association with TheSmokies.TV, will be made available online to the public for one week only - August 2nd - August 8 exclusively at http://www.thesmokies.tv/ with Silver, Gold and Platinum contribution packages available. This exclusive "closed-door" event features Llama Llama Red Pajama, a 20 minute children's musical adapted from the wildly popular children’s book and hosts LIVE performances by Baby Llama, Mama Llama, the Penguin Players and an exclusive guest performance by the legendary Dolly Parton. Also in both the Gold and the Platinum packages Dolly is featured reading her new children's book "I Am a Rainbow" to a special group of VIP children or as Dolly called them VIK (Very Important Kids) and singing the song she wrote of the same name along with the children and the Penguin Players. All contribution proceeds from the online broadcast benefit Dolly's Imagination Library national program as well as individual affiliates where contributions are made. Three great packages are available from just $5 and such a small contribution goes a long way to help our children! PLUS it is tax deductible. "We are extremely excited to bring this broadcast event to Dolly's Imagination Library family and we are sure that parents and children alike will enjoy these performances and at the same time, this will be a direct benefit to this wonderful program and all local affiliates that make this possible! "...Jacob Timmons, President, S.D. Professionals, LLC. The Smokies.tv makes entertainment available via the internet with easy, on-demand viewing. The event is only available on http://thesmokies.tv/ and is one not to miss! Log on today to http://thesmokies.tv and read all about the three fantastic packages offered. Children and adults alike will marvel at this special event aimed at family values that Dolly has brought to the world via The Imagination Library.